Normally, the electric shaver gets the work done. So, I almost never have to use a fixed blade razor for shaving my facial hair, but after seeing this, I think I should start using a fixed blade. 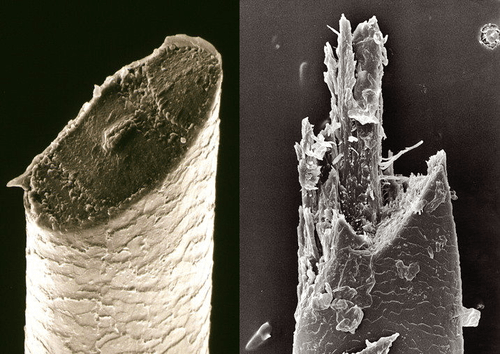 Here is a highly magnified image (using a scanning electron microscope) of two strands of hair. The left one was cut using a fixed blade and the right one was cut using an electric razor. See the difference for yourself. So, even if the major thing that causes a messed up strand is due to the fast moving blade of an electric razor, but one other important factor is the sharpness of the blade. The point is, electric shaver blades aren’t too sharp, while fixed blade steel razors are pretty sharp. Thus, the steel blades can give you a clean cut. Still, when it comes to fine tools, steel blades stand nowhere. 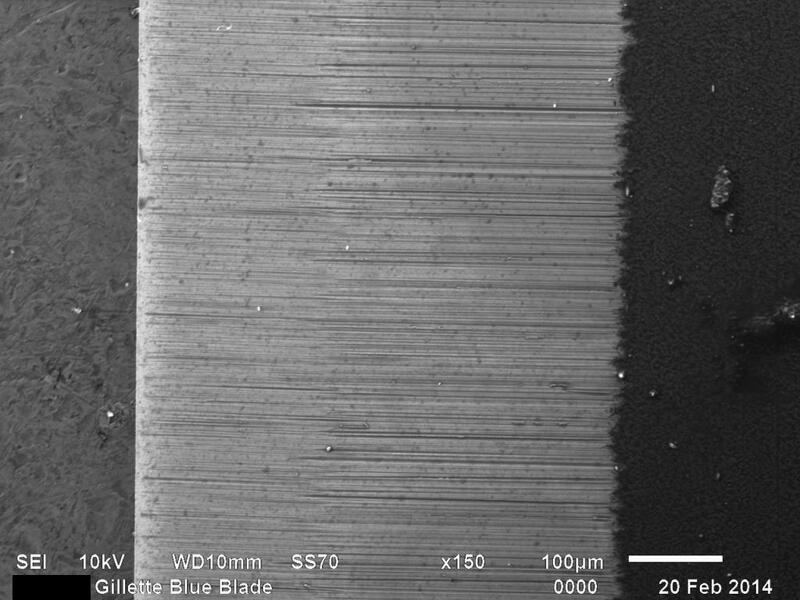 Look at what a Gillette blade looks like when its put under an electron microscope (at not even a very high magnification – 150x). Yes, even those seemingly perfect Gillette blades can be that jagged under high magnification. Thank goodness, blades can get much finer. Obsidian is a naturally occurring black volcanic glass. A glassy rock, you could say. It is very hard and of course, like most hard things are, it is brittle too. So, if it isn’t handled with good care, it breaks pretty easily. Yes, that kind of a rock. When it breaks, it forms very sharp edges. These edges can sometimes get much much sharper than your normal steel blades. Also, even if they are brittle, they are pretty durable in a sense that they can hold their edge for much longer times. These were the reason, our ancient palaeolithic ancestors used to chip these rocks and made them as the tips of their spears and arrows. Blade edges made out of obsidian are so sharp that they don’t seem jagged even when seen under an electron microscope. Their edges, if made carefully using processes like pressure flaking process, can get up to 3 nm thick. Good quality blades can make cuts down to single molecules! That is about 500 times sharper than the sharpest steel blade. Left: Obsidian tip under and electron microscope. Right: Steel point under an electron microscope. While blade edges made out of obsidian are not approved by the FDA, surgeon scalpels are still made using them. Studies say that cuts made using these blades get healed much faster than the ones made by steel blades because obsidian blades can make extremely narrow cuts between the cells, and not tear the cells apart. Of course synthetic diamond blades have been made. But obsidian blades are still better in terms of durability. Stone age technology is still the best. Please hit like if you learnt something from this article. I don’t mean to sound wry with the heading, but it’s a real story, and is a real fact. I can’t be held responsible, if you are stupid enough to try this “surgery” at home. Still, let me say it – Please don’t try this, even if you are stupid. There is no chance you’d survive this. The whole purpose of this article is to keep you informed. In short, it is about a man (you could even call him a boy) who suffered from an Obsessive Compulsive Disorder, shot himself in the head to commit suicide. The very act, ironically ended up curing himself of the OCD. To tell you a little about OCD, it is a disorder which creates a serious problem in someone’s life if they suffer from it. They get obsessed with doing some things repetitively. For example, people often have an OCD where they feel compelled to arrange things in stacks. Or others who can’t sit in ease if their clothes are not in a perfect order. Or some, who have an obsessive fear of germs and end up washing hands several times a day….etc. These disorders usually can make a person lonely as others start staying away from the seemingly paranoid person. Otherwise, they also create a problem in the sufferer’s life by consuming excess time, money, energy, etc of their’s. Most times, the person suffering from an OCD starts experiencing serious emotional distress or depression. In very rare and extreme cases, where anti-depressant and behaviour therapy doesn’t work, doctors resort to performing a surgery, where they remove a part of the brain from which the problem seems to come from. Even under controlled circumstances, this surgery is considered as a very serious one. About 30 years from now, a 19-year-old boy George, from Vancouver, British Columbia suffered from a serious problem that used to interfere with his normal life. He had an obsessive fear of germs and used to wash, and used to shower hundreds of times in a single day. Yes, really hundreds, not less. Doing this took away all of his strength and he found it hard to do anything else. This made his education and general life suffer as he could not attend school or work at any place. He was a top class student and had a pretty good IQ. But the boy was seriously depressed and often complained to his mother that he wanted to die. On unfortunate day, when the boy felt really troubled, he went down to his mother and complained that he wanted to die. This seemed like a final blow to the mother’s exasperation and she told him to go shoot himself. Not realizing the metaphoric nature of his mom’s statement, the boy decided to go and do just that. He went to the basement and shot himself in the head using a .22 long rifle. The bullet got lodged in the brain. Naturally, after this, he had to be rushed to the hospital. After a very long surgery, surgeons were able to remove the bullet, but couldn’t successfully remove all the fragments of the bullet that were lodged in the brain. Fact: There was a similar accident that happened at a particle accelerator, where a proton beam travelling at almost the speed of light, destroyed a part of a man’s brain and yet it left him with almost no serious complications. He went on to complete his PhD after that! When three weeks later he was admitted at the hospital again, for a check-up, there was no obsessive behaviour observed in him. He was left only with a few minor quirks that did not interfere much with his life. He had apparently cured himself by shooting himself in the brain and destroying the part where the problem originated from. At the same time, his IQ did not drop and and he passed other brain damage tests too! Such a miraculous surgery had never ever been recorded in the history. The Emerald Cockroach Wasp A.K.A Jewel wasp – a metallic blue/green colored, 2 cm long wasp – is something that will blow your mind by the way it reproduces. More specifically, the Emerald Cockroach Wasp uses venom to hack into cockroach brains, turns them into zombies and lays eggs inside them. With time, this live yet immobile cockroach body is hollowed out by the larvae of the wasp and the young ones come out eventually. At a time when the female Emerald Cockroach Wasp is ready to lay eggs, it competes with the other females to find a host to lay their eggs. When a wasp finds a good host – only this one kind of cockroach – the weird reproductive activity begins. The wasp attacks the cockroach and injects the first dose of venom into its central nervous system that is aimed at making the front legs of the cockroach paralyzed. Killing the cockroach with its venom is simple for the wasp, but keeping it alive is what matters here. So, the right amount of venom at the perfect place is injected. Now, when the cockroach can’t move its front legs, the wasp attacks again at a perfectly still moment to inject the second dose of venom. It carefully sticks the stingers into the brain of the victim in a way that the perfect amount of venom reaches the exact place in the brain of the cockroach which controls escape reflex. In short, it performs a micro neurosurgery and turns the cockroach into a zombie – Now it gets completely under control. Next, the wasp chews off half the antennae from the cockroach’s head and drinks its blood to gain energy. Then it grabs the cockroach by its antennae and hauls it into a burrow, lays the eggs on the abdomen of the cockroach, goes out and obstructs the entryway of the burrow using small pebbles to ensure that the host doesn’t escape. The calm zombie-cockroach is left in there to take care of the larvae for several days. The larvae hatches, drills a hole into the body of the cockroach, eats it from the inside, hollows is and comes out after a few weeks as a grown up wasp. The cockroach is dead.